We help you breathe better. Pulmonary diseases are any abnormal condition of the respiratory system, characterized by cough, chest pain, dyspnea (difficult or labored breathing), hemoptysis (coughing up blood), sputum (saliva and mucus) production, stridor (vibrating noise while breathing), or adventitious (involuntary) sounds. Less common symptoms include anxiety, arm and shoulder pain, tenderness in the calf of the leg, erythema nodosum (reddening of the skin), swelling of the face, headache, hoarseness, joint pain, and somnolence (drowsiness). Our pulmonologists use different diagnostic procedures for pulmonary diseases, which include bronchoscopy; cytologic, serologic, and biochemical examination of bronchial secretions; laryngoscopy; pulmonary function tests; and radiography. Obstructive respiratory disease is the result of airway reduction that impedes air flow due to bronchospasm, edema (inflammation) of the bronchial mucosa, or excessive bronchial secretions. Obstructive disease is characterized by reduced expiratory (exhaling) flow rates and increased total lung capacity. 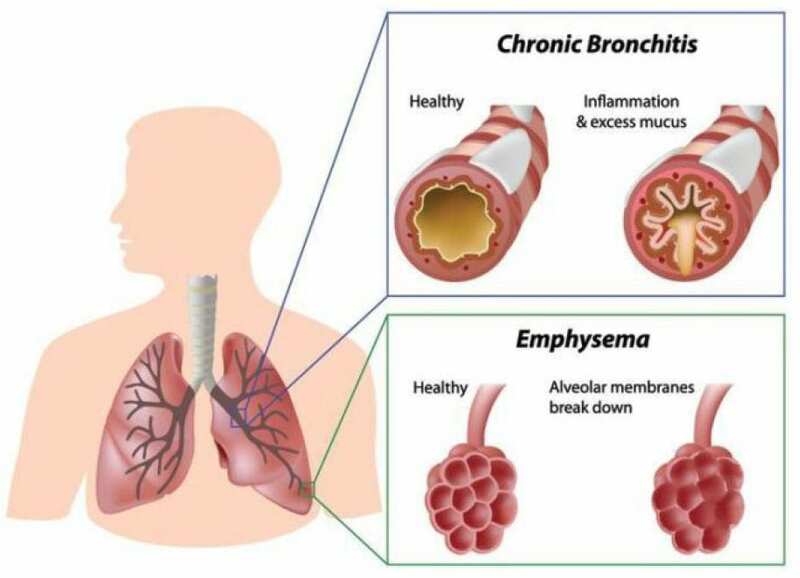 Acute obstructive respiratory diseases include asthma, bronchitis, and bronchiectasis; chronic obstructive diseases include emphysema, chronic bronchitis, or combined emphysema and chronic bronchitis. Patients with obstructive diseases may have acute respiratory failure from any respiratory stress, such as infections or general anesthesia. Restrictive respiratory disease is caused by conditions that limit lung expansion, such as fibrothorax (thickening or scarring of the pleural space), obesity, a neuromuscular disorder, kyphosis (spinal curvature), scoliosis, spondylitis (inflammatory spinal arthritis), or surgical removal of lung tissue. Pregnancy causes a self-limiting restrictive disease in the third trimester. Characteristics of restrictive respiratory disease are decreased forced expired vital capacity and total lung capacity, with increased work of breathing and inefficient exchange of gases. Acute restrictive conditions are the most common pulmonary cause of acute respiratory failure. Infectious diseases include pneumonia and tuberculosis. Characterized by a reduction in airflow. Shortness of breath in exhaling air. Characterized by a reduction in lung volume. Difficulty in taking air inside the lung. Call 239.574.2644 or send us a message to schedule your appointment today. Should you need fast relief or want to know more about your condition, you may find answers that fit your situation on our Facebook page and visiting these resources.